Do you want to broadcast information about your local society, workshop, genealogical tip, or a research query? Just send it to the WSGS Blog and WSGS Meetings and Events! You can reach hundreds of genealogists from around the state. Just email a Word document, text file, PDF or graphic to WSGSBlog@wasgs.org and WSGSWebManager@wasgs.org and we’ll do the rest! We’re always looking to publicize local events and workshops, feature stories, updates from your society, and other genealogical information that might be of interest to our many subscribers and viewers. We hope to hear from you soon! And don’t forget to encourage your Society members to subscribe to the Blog for the most up-to-date information from around the state. Do you want to broadcast information about your local society, workshop, genealogical tip, or a research query? Just post to the WSGS Blog! You can reach hundreds of genealogists from around the state. Just email a Word document, text file, PDF or graphic to WSGSBlog@wasgs.org and the blog team will do the rest. We’re always looking to publicize local events and workshops, feature stories, updates from your society, and other genealogical information that might be of interest to our many subscribers. Do you want to broadcast information about your local society, workshop, genealogical tip, or a research query? Just post to the WSGS Blog! You can reach hundreds of genealogists from around the state. Just email a Word document, text file, PDF or graphic to WSGSBlog@wasgs.org and the blog masters will do the rest. You may manage your subscription options here. Have you ever wondered who’s behind the scenes of the WSGS Blog? 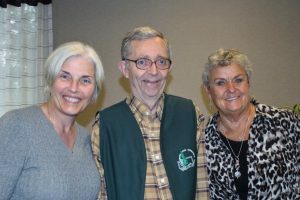 The terrific trio of Charles Hansen, Roxanne Lowe and Donna Potter Phillips work together to bring you interesting articles, news and tidbits about genealogy and family history in Washington State and the Pacific Northwest. All three of them are at the WSGS Conference in Tacoma tomorrow (18 Jun 2016), so look for news and photos about what’s happening there. In the meantime, if you’re looking to publicize your local event or workshop, have a feature story or update about your society, or other genealogical information that might be of interest to our many subscribers, just email a Word document, text file, PDF or graphic to WSGSBlog@wasgs.org and Charles, Roxanne and/or Donna will do the rest. The blog is a great way to reach hundreds of genealogists from around the state and beyond.